Jonathan Kregor is a musicologist specializing in nineteenth-century music. His research interests include aesthetics, Franz Liszt, musical reproduction, music and memory, virtuosity and gender, and art song. He has published articles and reviews in The Journal of Musicology, The Musical Quarterly, Nineteenth-Century Music Review, Journal of the American Liszt Society, and Notes; and has given papers at numerous national and international conferences. He is a recipient of fellowships from the German Historical Institute and the Stiftung Weimarer Klassik. Kregor is the author of Liszt as Transcriber (Cambridge University Press, 2010), which won the Alan Walker Book Award from the American Liszt Society, and Program Music (Cambridge University Press, 2015). He has edited volumes of C.P.E. Bach's keyboard music (Packard Humanities Institute) and Clara Schumann's unpublished arrangements for solo piano (A-R Editions), and has co-edited Liszt et le France. 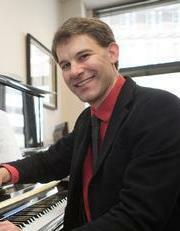 Since 2012 he has been editor of the Journal of the American Liszt Society. PhD, Harvard University, Cambridge, MA, 2007. MA, Harvard University, Cambridge, MA, 2004. BM, University of North Carolina, Chapel Hill, NC, 2001. Jonathan Kregor (2013). "Forging &apos;Paganinis of the Piano&apos; in the 1830s". Studia Musicologica, 54 (2), 115-134. Jonathan Kregor (2011). "Liszt&apos;s Late Songs, With and Without Words". Journal of the American Liszt Society, 61/62 (1), 159-189. Jonathan Kregor (2011). "Liszt&apos;s Wagner". The Wagner Journal, 5 (1), 17-43. Jonathan Kregor (2009). "Stylistic Reconstructions in Liszt&apos;s Late Arrangements". The Musical Quarterly, 91 (3-4), 200-239. Jonathan Kregor (2007). "Collaboration and Content in the Symphonie fantastique Transcription". The Journal of Musicology, 24 (2), 195-236. Jonathan Kregor (2007). "Liszt, Yesterday and Today". Nineteenth-Century Music Review, 4 (2), 141-153. Jonathan Kregor (2015). “Disavowing the Instrumental Battle Piece”. Journal of Musicological Research, 34 (3), 204–223. Jonathan Kregor (2012). Clara Schumann, Arrangements for Solo Piano, Recent Researches in the Music of the Nineteenth and Early Twentieth Centuries 56. Madison, WI: A-R Editions (Editor). Jonathan Kregor (2012). Liszt et la France: Musique, culture et société dan l&apos;Europe du XIXe siècle. Paris: J. Vrin (Co-Editor). Jonathan Kregor (2008). C. P. E. Bach, Arrangements of Orchestral Works, ser. I, vol. 10.2, of Carl Philipp Emanuel Bach: The Complete Works. Cambridge, MA: Packard Humanities Institute (Editor). Jonathan Kregor (2014). "Transcription and the Legacies of the Composer-Pianist". Liszt&apos;s Legacies. Stuyvesant, NY: Pendragon Press. Jonathan Kregor (2012). "Liszt and the Construction of a ‘Panthéon musical&apos;". Liszt et la France: Musique, culture et société dans l’Europe du XIXe siècle. Paris: J. Vrin. (06-2014). Disavowing the Instrumental Battle Piece. University of Toronto, Toronto, Canada. (06-2014). Religious Expression in the Harmonies poétiques et religieuses. James Madison University, Harrisonburg, VA.
(11-2013). Liszt&apos;s Instrumental Songs. Department of Music, University of Kentucky, Lexington, KY.
(07-2013). Faust in the Wakes of Wagner and Liszt. Texas Christian University, Fort Worth, TX. (04-2013). A Canon for the Cosmos: The Music of the Voyager Spacecraft. Department of Music, University of Oregon, Eugene, OR. (04-2013). Clara Schumann, Johannes Brahms, and the Dialectics of Transcription. University of Cincinnati, Cincinnati, OH. (11-2012). Paganini and the Transcendent in Nineteenth-Century Piano Music. Berea College, Berea, KY.
(05-2012). Liszt and Berlioz. University of Oregon, Eugene, OR. (05-2012). Liszt and the Art of Transcription. University of Oregon, Eugene, OR.